Please welcome Suzanne Johnson to The Qwillery as part of the 2012 Debut Author Challenge Interviews. 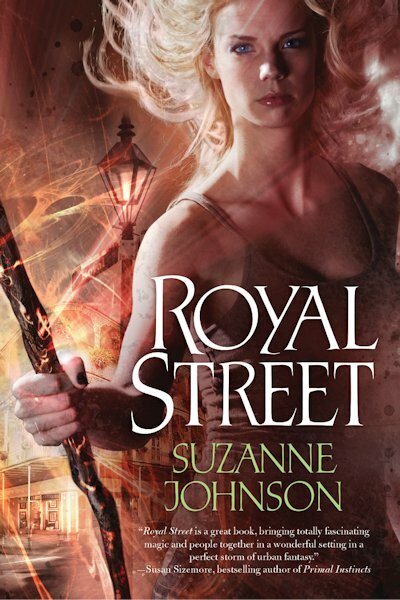 Royal Street, Suzanne's debut, was published yesterday, April 10th. 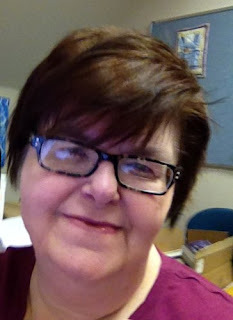 You can read Suzanne's Guest Blog - Fantasy, Meet Reality - here. Suzanne: Hm…not sure how interesting it is, but I’ve developed a system that works for me. My first draft, which I call “draft zero” (and which NOBODY sees) is usually about only two-thirds the length of the finished book. Really bare bones, where I’m working out the plot with no descriptions or setting details. Then I go back and layer in the other stuff. Suzanne: Probably the biggest influence has been Stephen King. I grew up reading his stuff, and still do. Whether or not you like horror, which has a lot in common with urban fantasy, the man can tell a good story. In urban fantasy, I love Jim Butcher. In paranormal romance, I’m all about the Black Dagger Brotherhood. Outside the speculative fiction genre, I think the writing of my fellow Alabama author Rick Bragg is brilliant. If he published a phone book, I’d buy it and read it. Suzanne: A serious plotter. Royal Street was the first novel I’d ever attempted, and I didn’t yet realize the value of plotting. So it went through a lot of upheavals and scene cuts and bloody, brutal surgery. I recently finished the third book in the series and I think my outline was something like 12,000 words long! TQ: What is the most challenging thing about writing for you? Suzanne: Finding time to write, definitely. I have a full-time job as associate editor for a quarterly university magazine, plus family obligations. I’ve had to give up a lot—sleep and any semblance of a social life, LOL. TQ: Describe Royal Street (Sentinels of New Orleans 1) in 140 characters or less. Suzanne: Katrina topples New Orleans’ supernatural levees, monsters invade, junior wizard learns to fight. Must love pirates, voodoo queens, magic. TQ: What sort of research did you do for Royal Street? Suzanne: I re-read all the Times-Picayune (New Orleans’ daily newspaper) coverage from Hurricane Katrina, making sure my plot followed the exact timeline of what happened when—when the lights came back on, when the water was drinkable, when Hurricane Rita came through, etc. Also read biographies of pirate Jean Lafitte and jazz great Louis Armstrong to make sure I portrayed them as accurately as I could. Quite a bit of research on voodoo. And I re-read my own blog that I maintained for a couple of years after Katrina, to remind myself of what I was bitching and moaning about at the time (which was a lot!). Suzanne: The easiest has probably been the pirate Jean Lafitte, because after reading several biographies of him I now find him totally fascinating. In the original version of the book, I’d planned for him to be in one scene—the first one in the novel—and never see him again. But he just kept coming back and ended up really impacting the direction the whole series is going. The hardest character to write has been Jake Warin, a veteran who was injured badly in Afghanistan and has gone through some rough years before Royal Street begins. He’s had issues with alcohol, and sometimes his head goes to really dark places. Yet on the outside, he’s charming and flirtatious. His story arc over the first three books takes a lot of dark turns. TQ: Without giving anything away, what is/are your favorite scene(s) in Royal Street? Suzanne: One of my favorites is a scene that takes place at the Napoleon House, which is a bar and restaurant in the French Quarter that was built around 1800 as a residence. Napoleon Bonaparte had been invited to spend his exile there, but never made it. It’s one of my favorite places in New Orleans. But in the book, the Napoleon House is still closed for Katrina, and my heroine DJ ends up in a dramatic scene with a gaggle of pirates. I can’t say much more without spoilers. I also like the scene early in the book when DJ’s new partner Alex shows up, guns ablaze. It was fun to write. Suzanne: Beginning in April, I’ll have “Easter Eggs” on my website for those who want some backstory on things like how character names were chosen, info on the places the characters go, what in real life inspired certain scenes, etc. I’ll be talking about the book and signing copies in April and May in New Orleans, Houston, Dallas, Atlanta, Birmingham, Portland, and San Diego. Dates and times are on my website (www.suzanne-johnson.com). I’ll also be at Authors After Dark in August. The second book in the series, River Road, will be out November 13! While winds howled and Lake Pontchartrain surged, the borders between the modern city and the Beyond crumbled. Now, the undead and the restless are roaming the Big Easy, and a serial killer with ties to voodoo is murdering the soldiers sent to help the city recover. To make it worse, Gerry has gone missing, the wizards’ Elders have assigned a grenade-toting assassin as DJ’s new partner, and undead pirate Jean Lafitte wants to make her walk his plank. The search for Gerry and for the serial killer turns personal when DJ learns the hard way that loyalty requires sacrifice, allies come from the unlikeliest places, and duty mixed with love creates one bitter roux. Urban fantasy author Suzanne Johnson grew up in rural Northwest Alabama, halfway between the Bear Bryant Museum and Elvis’ birthplace. That, plus living in New Orleans for fifteen years, has given her a highly refined sense of the absurd and an ingrained love of SEC football and fried gator on a stick. Her debut novel, Royal Street, will be released on April 10, 2012, by Tor Books, and will begin an urban fantasy series set in New Orleans during and immediately after Hurricane Katrina. The second book in the series, River Road, will be released in November 2012. By day, Suzanne is an editor at Auburn University despite being a graduate of the University of Alabama, which she thinks makes her bilingual. She lives in Auburn with two dogs named after professional wrestlers—a story she is not inclined to share (unless you catch her at the Napoleon House during Authors After Dark 2012). What: One commenter will win a copy of Royal Street (Sentinels of New Orleans 1) from The Qwillery. Who are some of your favorite wizards in books, movies, and/or tv? Who and When: The contest is open to all humans on the planet earth with a mailing address. Contest ends at 11:59pm US Eastern Time on Wednesday, April 18, 2012. Void where prohibited by law. No purchase necessary. You must be 18 years old or older to enter. My favorite wizards are Harry Potter and Harry Dresden. Yes, Hermione is the best, IMO!! I also like Gandalf! I can't wait to read Royal Street - thanks for the interview and giveaway! I've been looking foward to Royal Street's release. I would have to say Catcher from the Chicagoland Vampire series! Love him! I love the cover! I think this book sounds like something I would really enjoy. Thanks for the chance. I've heard such awesome buzz about this book, I would love to read it! Well, obvious answer is Harry Potter. I love those books. My favorite was always Sirius (wah wah), followed by Lupin (wah wah again), followed by Fred & George (srsly, J.K. Rowling?). I'll give the non-HP spot to Tamsin Green from Once a Witch. Hermione! edysicecreamlover18@gmailDOTcom GFC Krystal Larson Thank you for the great giveaway! Oh I really need to read more Jim Butcher's books, I've only read the first one for now. So my favorite wizard... wow it's a difficult question. I think I'll choose Alex Craft from the Kaylana Price series. Hands down Harry Dresden is my favorite wizard. Of course, the two Harrys - Harry Potter and Harry Dresden! my favourite wizard would have to be Merlin. He's the first wizard I can remember reading about and I've kinda used him as a bench mark when reading about wizards ever since. I do so enjoy Jim Butcher's HArry but I am also a HArry POtter fan. Mine is Pug (or Milamber) from Raymond E. Feist's Magician series (the 1st 3 books anyway). I've not read any in books, but in movies I guess I would have to say Merlin and Harry Potter. I love love love Merlin on the syfy channel! I think one of my favorite wizards is Esra from The Riyria Revelations. He was a powerful wizard in his time, but now he has no hands. Yes, a penalty for his "crimes" as he is a wizard & used his hands to weave. But he is smart, and full of knowledge, and can teach others. Ha! Yes! Great post and I was just talking about this book with Rissatoo on Twitter today. Now I need a copy. ;D Thank you! I'm a Terry Brooks fan, so I'll say Allanon. But Belgareth is up there too. Harry Dresden is a favorite from the short lived TV show and Jim Butcher's books. I also like Jaye Wells' Adam - he's called a Mage but I believe it's basically the same thing. GFC follower - Barbara E.
Harry potter was my first and you never forget first love! I must say Harry Potter is my all time favorite. But I love Gandalf from LOTR too. And I've always found the wizard from "The Wizard of Oz" to be very funny. I like Howl from Howl's Moving Castle. My favourite wizards are all the good guys from the Harry Potter series and Catcher Bell from Chloe Neill's Chicagoland Vampires. This is a new title and author for me, I read a little about Royal Street yesterday and am very intrigued :) My favorite wizards have to include Dumbledore of course and then there is Harry Dresden who is awesome! Thank you for taking the time and effort to share with us! My favorite wizards are Gandalf from The Lord of the Rings Trilogy and Samantha Stevens from Bewitched. My favorite wizard is Harry Dresden, but I just finished Royal Street and I enjoyed meeting DJ. She doesn't always make the prudent choices, but that is soooo believable! I'm really looking forward to River Road in November! I like Harry Potter and Merlin. i love Harry Potter, Harry Dresden, and Gandolf from LoTR. All the wizard teachers at Hogwarts are brilliant. I wish I had had teachers like that. Mine were nuts, but without the magic. My favorite wizards are Merlin (of course) and Orpheus. Great interview! Congrats, Suzanne, on your new release and debut! Thank you for the opportunity to read your story.